“Form: to form young heads, lives, art, woods, stones, irons, houses, tables, libraries, grating for own windows, gates and iron sculptures, create figures from canvas and colors. Well: this is what I’ve always done…”. This is how one of the most important intellectual and philosopher of the Twentieth Century defined his life: Dino Formaggio (1914-2008), art critic and artist, was able to establish deep connections with the most important artists of his time, in a continuous exchange where the artworks, donated to him by friends painters and sculpturs, are now the nucleus of a contemporary art museum founded in the historic Palazzetto Vicari in Teolo. A lively and pulsing center that aims to be constantly connected with the town, the artisans and the territory of Colli Euganei. Interview with Daniele Formaggio, Dino’s son and director of the museum, and to the artistic curator Sergio Giorato, about the origin, the development and the future projects of MAC. Selena Maran: How is born the idea of a museum dedicated to Dino Formaggio? Daniele Formaggio: The idea is born from dad. Dino Formaggio moved from Milan to Teolo in 1966 and he was welcome with a lot of cordiality from the people of this town, establishing from the very beginning a deep relationship with the local artisans of iron and wood. For all of his life he has been attracted by crafts and handworks, considered a vehicle of trasmission of the thought and structure of an artwork, and after he dedicated himself to the art of iron, wood and stone. When in 1990 he moved to Illasi, inspired by the small Occitan museums known in France, he decided to donate an important collection of artworks to the district of Teolo, to found a contemporary art museum as a gratitude to the people. During the years he donated more than 190 works among canvas, sculptures and etchings. Later the major of Teolo decided to dedicate the museum to Dino Formaggio, as foundator of the project. S.M: The re-opening of MAC was on 27th June 2015. Which are the innovations and how is MAC developed during these years compared to the first opening in 1993? D.F: The first innovation is the brand MAC (Contemporary Art Museum) Dino Formaggio. With the reopening there is also a internal rearrangement of the spaces and exposition: having a large number of works, we rotate them in order to offer every year a new set-up of the collection of Dino Formaggio, creating expectation and attraction to the cultural turism for the museum. Sergio Giorato: However the origin remains the same, which means respect for the collectionistic spirit of the philosopher. Thanks to his friendships and frequentations, he collected works of artist friends and donated them to Teolo, to found a contemporary cultural art institute. Compared to 1993, in the last years the collection has grown and, because of the impossibility to propose the complete collection in the actual spaces, periodically we choose to rotate the works. D.F: Another innovation is the project “A work for Dino”: artists who haven’t personally known dad, temporary give one of their works to create an ideal dialogue, manteining a lively museal itinerary. The first is Luciano Zarotti and he’s exhibiting from September to November 2015. S.M: What is the found entity of the artworks collected in the museum? D.F: It’s a contemporary art museum born thanks to the great friendships that Dino had with the most important artist of his time, and the actual exposition itinerary follows the periods of dad’s life. S.G: Like Daniele said, from the philosopher biographical information we have proceed to the exposition itinerary, divided in three moments: period in Milan and period in Veneto, the last one divided in two parts, Teolo and Illasi (Verona). The exposition doesn’t follow an artistic period or an art school, but it’s been chosen to give importance to Dino’s life through the artworks exposed. D.F: A first section is dedicated to artists’ etchings like Otto Pankok, Sergio Tarquinio and others, together with the important Tito Gasparini’s donation, one of the first artist who Dino Formaggio helped and introduced inside the world of art. These works the first collectionistic nucleus of Dino. Upstairs we have the works that belong to the period in Milan, probably the most precious: we can find Tomea, Birolli and Aligi Sassu, near the works of the period in Veneto, the longest and bigger one. Actually 85 works are exposed, but the entire collection counts about 200 works. 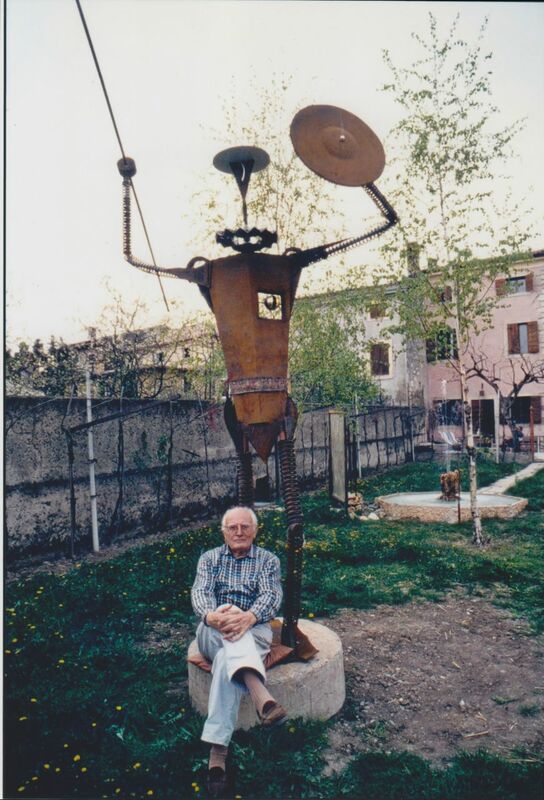 Dino Formaggio and his work “Don Chisciotte” 1991. Courtesy of MAC. S.M: MyTemplArt Magazine is particularly focused on the digital conservation of the informations and promotion of collections through the new technologies. What is the position of MAC about these thematics? D.F: With the re-opening, there was a huge work on this thematic, also thanks to a group of volunteers. In part we have already digitalised some works, available on our website, and we’re digitalising Dino’s critical works, all the artworks catalogue and the biography of the artists. At the end of the year we hope to have a complete and updated website. Technologies are really helping us with all this wide work. 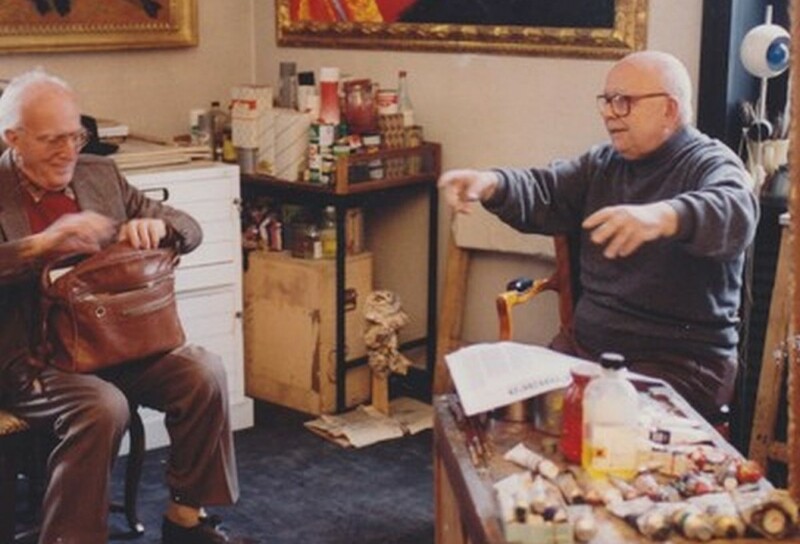 Everything related to the written archive of dad, such as dialogues with artists, post and more, is being digitalised by the University of Milano, which follows and manages the section of Dino’s works related to philosophy and art criticism. 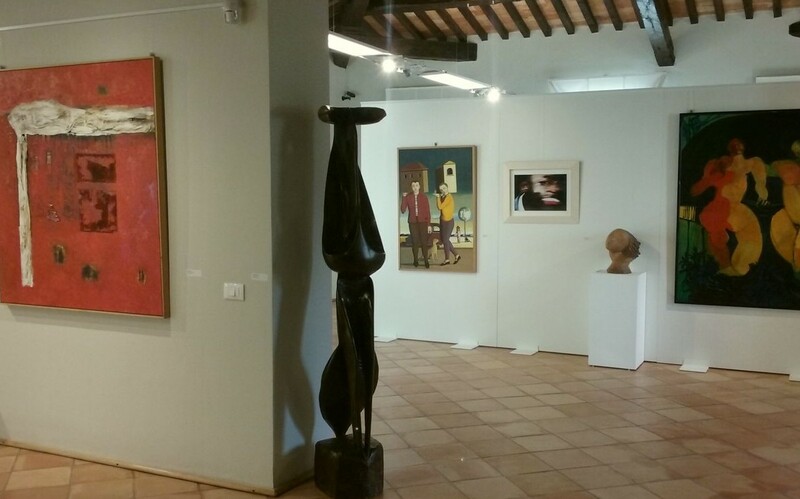 S.M: A free entry museum with artworks exposed in rotation and sorrounded by Colli Euganei. How do visitors and citizens of Teolo have considered it? Which kind of dialogue was established with the local territory? D.F: With this new opening we’re having a moderate partecipation, compared to the past we have increased tenfold the presences. We are keeping now the free entry at MAC, at the same time we hope for more partecipation from the citizens, to create the deep dialogue that Dino Formaggio has always wished when he donated the artworks to the city. If we think the terrritory of Colli Euganei like a sort of mosaic and MAC like a piece of it, it can become one of the most characteristic element, attracting cultural turism in our local territory, creating a synergy with other important attractive places such as Abbazia of Praglia, Villa Vescovi…, a possibility that could change the economy and this is what we’re trying to do. S.G: The museum could be a great opportunity for the territory, connecting with the turism economy and so trying to mantain it in the historic centre of Teolo and Colli Euganei. S.M: What are the future projects of MAC? D.F: I’m working to establish a foundation for the management of openings and programs of MAC, according to major of Teolo and his administration, who will guarantee the management of the maintenance and users of the building. Other ideas and projects are the organisation of dinners with philosophers and artists inside the museum, in collaboration with local restorators, in order to give value to the products of our territory and to do fund-raising for the museum itself. S.G. Through MAC we want to create a real cultural centre, keeping a dialogue with the territory. Plus we’re publishing also all the conferences held in 2014 for the Dino’s centenary of birth, realised in collaboration with the University of Padova. This is really important for defining Dino Formaggio’s figure and role and his contribution for the italian contemporary aesthetics. D.F: The museums need to be lived: it means that people should enter not only to see artworks, but also for other activities, places where you can connect, confront and talk about art, culture and philosopy, something that we’ve lost during in the years and we’d like to keep on doing. Friday from 3.00 p.m. to 7.00 p.m.
Saturday and Sunday from 10.00 a.m. to 1.00 p.m. and 3.00-7.00 p.m.